On Tuesday, February 12, the feast of the Three Great Hierarchs – Basil the Great, Gregory the Theologian, and John Chrysostom – Metropolitan Hilarion of Eastern America & New York celebrated Divine Liturgy and led the episcopal consecration of Archimandrite Luke (Murianka) as Bishop of Syracuse, Vicar of the Eastern American Diocese in Holy Trinity Monastery in Jordanville, NY. Despite the threat of inclement weather, hundreds of clergy and faithful assembled in the monastery’s Holy Trinity Cathedral. Many of the clergy are or have been the spiritual children of Fr. Luke, and were under his guidance as one-time Dean of Students of the Holy Trinity Seminary. Many also came to rejoice at the fact that, once more, the monastery will have a bishop-abbot. Since the 1940s, the abbot of the monastery has had as its abbot a bishop, until the repose of Metropolitan Laurus (Skurla) in 2008. The First Hierarch of the Russian Church Abroad was co-served by Metropolitan Luke of Zaporozhye & Melitopol, Archbishop Gabriel of Montreal & Canada, and Bishop Nicholas of Manhattan, as well as over 40 diocesan and monastery clergy. The Confession of Faith began shortly after the solemn greeting of Metropolitan Hilarion. During this rite, the bishop-elect details the teachings of the Orthodox Church and gives an oath before those gathered to observe the rules of the Apostles and the Œcumenical Councils. After this, a protodeacon intones the customary Polychronion. Following the Trisagion, the Rite of Episcopal Consecration took place. Many were moved to tears by a sense of the presence of the Holy Spirit. Long time acquaintances and relatives of Fr. Luke, gazing upon this all, felt their long-held desire for his elevation fulfilled. The triple "Axios!" rang out from the clergy, followed by the monastery choir as each episcopal vestment was placed upon the now-Bishop Luke. 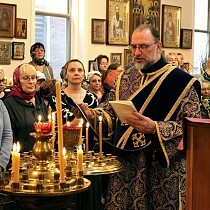 Singing at the Divine Liturgy was the monastery and seminary choir under the direction of Deacon Nicholas Kotar. I extend my heartfelt congratulations on your receiving the great grace of the episcopacy. Grand and joyous is this feast day not only for you, but for the brethren gathered in this monastery dedicated to the Life-Creating Trinity. Now Christ has set you upon the "candle-stand" of hierarchal service after a very long time living in this monastery. Entering here in your younger years, you performed the undertaking of spiritual labor under the ægis of this monastery and under the guidance of elders wise in the ways of monasticism. The entire way of life here is directed toward one goal: to emulate Christ as possible: prayer, divine services, obedience, active struggle with sin and the attentive reading of the works of the Holy Fathers and Teachers of the Church, including the Œcumenical Hierarchs being celebrated today. It is this path in maturing in Christ that a monk follows, when he humbly carries the yoke of the Gospel. While studying such knowledge of properly ordering one’s soul and its eternal salvation, many lanterns of the Church departed to solitude in the wilderness and in monasteries, and then, as a result of heresies, schisms, or difficulties in the administration of the Church, they would be called to a special form of service to the Church. And now in these difficult times of weakened faith, divisions, and temptations in inter-Orthodox affairs, the persecution and sufferings of believers, the Chief Pastor calls you to the lofty service to His Church, "which He purchased," as we sing during these days, "with His honorable Blood." What spiritual qualities are demanded of a bishop during such exceptional times? Of course, first of all, firm faith and complete subjection to the will of God. When a helmsman confidently holds the wheel of the vessel he steers, then all the passengers are at peace. So it is with the ship of the Church: when the ship’s helmsman not only firmly believes in God, but trusts in His leadership, then prayerful, peaceful, calm, and constructive life reigns in the Church. In writing to his disciple Timothy, the Apostle Paul exhorts him to remember the genuine Faith which his grandmother and mother had possessed before, and that establishing himself in this must be the subject of his constant efforts. "Take heed unto thyself," he says, "and unto the doctrine; continue in them: for in doing this thou shalt both save thyself, and them that hear thee" (I Timothy 4:16). May the edifying examples of the many ascetics who are buried here, many of whom you knew personally, serve to your spiritual benefit, consolation, and strengthening in continuing their great work. May they point you to every truth! 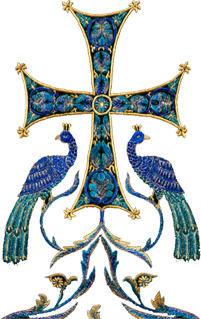 Receive this staff as a symbol of new responsibilities lain upon you today, ascend the cathedra, lift your monastic hands over the monastics and worshippers gathered here, who await your first Archpastoral blessing. After being presented with the archpastoral staff, Bishop Luke blessed the faithful for the first time. A festal luncheon was prepared for all, where congratulatory addresses were read from hierarchs, monastery brethren and seminary students.